Derek Jeter was pulled in the top of the 3rd after an RBI single to finish off his career. 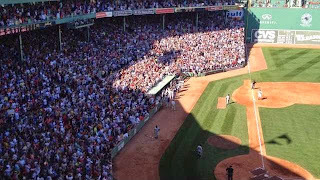 Fenway (filled with tons of Yankee fans as well as Sox fans) gave Jeter a two minute standing ovation. Now that Rivera and Jeter have retired and received multiple ceremonies, can we please go back to these two teams hating each other? Thanks. Video courtesy of Mike Petraglia.